Keiller, Patrick:”Imaging” in Matthew Beaumont and Gregory Dart (eds): Restless Cities (London: Verso, 2010), pp.139-154. Keiller, Patrick: “Popular Science” in Anthony Kiendl (ed. ): Informal Architectures: Space and Contemporary Culture (London: Black Dog, 2008), pp. 32-37. Keiller, Patrick: “Urban Space and Early Film” in Andrew Webber and Emma Wilson (eds): Cities in Transition: The Moving Image and the Modern Metropolis (London, New York: Wallflower, 2008), pp. 29-39. Keiller, Patrick: “Phantom Rides: The Railway and Early Film” in Matthew Beaumont, Michael Freeman (eds): The Railway and Modernity: Time, Space, and the Machine Ensemble (Oxford etc: Peter Lang, 2008), pp.69-84. Keiller, Patrick: “Londres, Bombay” in Vertigo Vol. 3 No. 6 Summer 2007, pp. 38-39, 42-23. Keiller, Patrick: “Film as Spatial Critique” in Mark Dorrian, Murray Fraser, Jonathan Hill, Jane Rendell (eds): Critical Architecture (London, New York: Routledge, 2007), pp.115-123. Anderson, Jason: “London Mapping: Patrick Keiller’s Peripatetic Hybrids”, interview with Patrick Keiller, Cinema Scope 26, 2006. Keiller, Patrick:”Coal Hopper, Nine Elms Lane, ” in Iain Sinclair (ed): London: City of Disappearances (London: Hamish Hamilton, 2006), pp.292-295. Connarty, Jane; Lanyon, Josephine and others: Ghosting: The Role of the Archive within Contemporary Artistsâ€™ Film and Video (Bristol: Picture This, 2006), pp.106-109. Demorgon, Laurence: “Robinson, pÃ©lerin du monde global”, “Architecture d’aujourdhui“350, January-February 2005, pp.24-25. Keiller, Patrick: “Tram Rides and Other Virtual Landscapes” in Simon Popple, Patrick Russell, Vanessa Toulmin (eds): The Lost World of Mitchell & Kenyon: Edwardian Britain on Film, (London: BFI, 2004), pp.191-200. Misselwitz, Philipp: “Reichtmer im Zerfall”, interview with Patrick Keiller in Philipp Oswalt (ed): Schrumpfende StÃ¤dte, (Berlin: Hatje Cantz Verlag, 2004), pp.554-559; English edition 2006, pp.554-559. Keiller, Patrick: ‘The City of the Future’ in City 7:3, November 2003, pp.376-386. O’Pray, Michael: Avant-Garde Film: Forms, Themes and Passions (London, New York: Wallflower, 2003), pp.107-118. Keiller, Patrick: ‘London in the Early 1990s’ in Andrew Gibson and Joe Kerr (eds): London from Punk to Blair (London: Reaktion, 2003), pp.353-361 and AA Files 49: London: Postcolonial City (London: Architectural Association, 2003), pp.20-24. Keiller, Patrick: ‘London-Rochester-London’ in Cedric Price and others: Re:CP (Basel, Boston, Berlin: BirkhÃ¤user, 2003), pp.168-185. O’Neill, Eithne: London and Robinson in Space review in Positif 509/510 (July/August 2003), p.138. Keiller, Patrick: ‘The Poetic Experience of Townscape and Landscape’ and ‘Atmosphere, Palimpsest and Other Interpretations of Landscape’ reprinted in Nina Danino & Michael MaziÃ¨re (eds): The Undercut Reader (London, New York: Wallflower, 2003), pp.75-83, 204-208. Keiller, Patrick: ‘Sexual Ambiguity and Automotive Engineering’ in Peter Wollen and Joe Kerr (eds): Autopia (London: Reaktion, 2002), pp.342-353. Keiller, Patrick: ‘Architectural Cinematography’ in Kester Rattenbury (ed): This Is Not Architecture (London, New York: Routledge, 2002), pp.37-44. Keiller, Patrick: ‘Port Statistics’ in Iain Borden, Joe Kerr, Jane Rendell, Alicia Pivaro (eds): The Unknown City (Cambridge MA, London: MIT, 2001), pp.442-458. 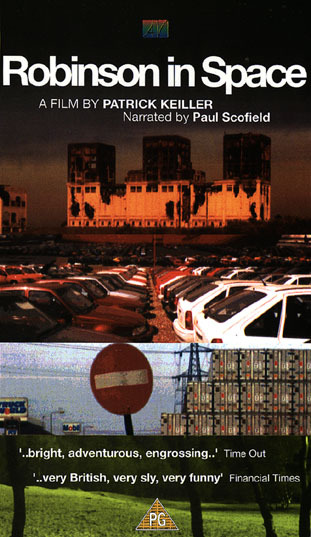 Dave, Paul: ‘Representations of Capitalism, History and Nation in the Work of Patrick Keiller’, in Justine Ashby and Andrew Higson (eds): British Cinema, Past and Present (London: Routledge, 2000), pp.339-351. Smith, Claire: ‘New Art Cinema in the 90s’, in Robert Murphy (ed): British Cinema in the ’90s (London: BFI, 2000), pp.145-155. Keiller, Patrick: ‘Popular Science’, in Landscape (London: British Council, 2000), pp.60-67. Richard Wentworth’s Thinking Aloud (London: National Touring Exhibitions, 1998), p.33. Keiller, Patrick: ‘The Dilapidated Dwelling’ in Sarah Wigglesworth and Jeremy Till (eds): The Everyday and Architecture, Architectural Design 68:7-8, 1998, pp.22-27. Keiller, Patrick: ‘The Tourist Poem’, Umeni XLIII:1-2, UDU AVCR, Prague, 1995, pp.45-47. Keiller, Patrick: ‘The Visible Surface’, Sight and Sound, November 1994, p.35. Keiller, Patrick: 1994 Berlin Film Festival programme text for London, reprinted as ‘Filming London Obliquely’, Regenerating Cities 7, 1994, pp.54-55. Sinclair, Iain: ‘Necropolis of Fretful Ghosts’, Sight and Sound, June 1994, pp.12-15. Keiller, Patrick: ‘Modern Architecture in Czechoslovakia 1919-1939’, published as ‘Czech Perspective’, Building Design, 13 March 1987, pp.22-25. O’Pray, Michael: review of Norwood, Monthly Film Bulletin, October 1984, pp.322-323. Keiller, Patrick: ‘Atmosphere, Palimpsest and Other Interpretations of Landscape’, in Undercut 7-8, 1983, pp.125-129. Keiller, Patrick: ‘The Poetic Experience of Townscape and Landscape’, in Undercut 3-4, 1982, pp.42-48.